Harley Davidson Fat Boy price starts at Rs.18.15 lakh (Ex-Showroom, Delhi). Powered by an all-new 1745cc Milwaukee-Eight 107, air-cooled, V-twin motor, the 2018 Fat Boy makes 144Nm at just 3000rpm. It gets a 6-speed transmission with tall gear ratios. Refinement levels are far improved than its predecessor, but the 6-speed gearbox still feels clunky. Fuel tank capacity of 19.1 litres is the same as the Heritage Classic, with the bike weighing 322kg in running order. 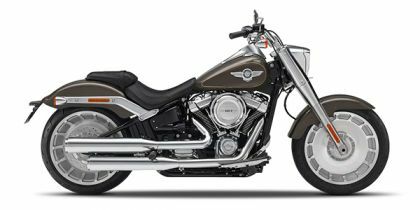 The chassis is from the all-new Softail lineup and is lighter and more rigid. Seat height is 670mm, while ground clearance is a low 115mm. So expect to scrape the bottom on most of our speed breakers i n town, especially with a pillion on board. The suspension setup includes front forks with Showa dual bending valves for faster responses and a rear monoshock with remote manual adjustment for preload. True to the classic theme, the Harley-Davidson Fat Boy gets 18-inch spoke wheels finished in chrome and come wrapped in 160/60 and 240/40-section tyres. Braking is via a single disc at both the front and rear. Share your experiences with Fat Boy? Q. I am confused between Suzuki Hayabusa and Harley Davidson fatboy?